Thursday night was chaotic. In the middle of dinner and baking and decorating cupcakes for a school bake sale, I still needed to make cookies for my husband to take to work the next morning. Instead of turning to a recipe I could depend on, I decided to add more work to my crazy evening by inventing a new cookie. Hey, why not right? With a large tub of ricotta about to turn I threw part of it into the mixer with a lemon cake mix and a few other ingredients. After the cookies cooled, I beat a can of lemon frosting with some leftover icing from the cupcakes and quickly piped a dollop on the tops with a large round Wilton tip 2A. I think the can of lemon frosting whipped well is all that would have been needed. I was attempting to pass these suckers off as homemade, which they were sort of! Soft, moist, cakey, and lemony these gems disappeared in a hurry. Frosting is probably optional here. I happen to like frosting, but these cookies were quite good without it too. 1. Preheat oven to 350 Degrees. Position rack in the middle of the oven and line cookie sheets with parchment paper. Parchment can be reused one time. 2. In a stand mixer beat together butter and ricotta until fluffy. Add egg, lemon extract, and lemon zest and beat until combined and fluffy. Add the cake mix and beat until combined. 3. With a mini or standard size cookie scoop drop dough onto parchment two inches apart. Dunk scoop into a glass of hot water and shake well after every few scoops when the dough gets difficult to release. 4. Bake a sheet at a time for 10 to 12 minutes or until lightly browned on the bottom. I used a mini cookie scoop; it might take a minute or two longer for standard sized cookies. 5. Let sit on the cookie sheet for a couple of minutes and move to a cooling rack to finish cooling. 6. 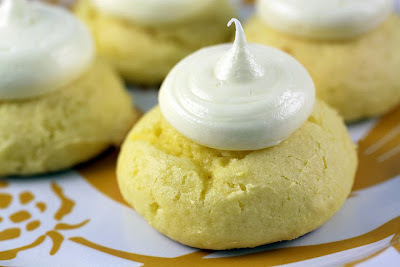 Once cool, whip frosting until fluffy and pipe a dollop on top of each cookie. Love lemon! And they're so cute with the little dollop of frosting on top :) Cake mixes are good for so many things...yum! so glad you were able to find a use for your ricotta... would have been such a shame to see it go to waste. Aren't cookie scoops the best? I have 5 in different sizes... would love to have 5 more, but I don't have the space. Anyway, your cookies are adorable! Love, love, love the photo! YUM these sound delicious! I have some ricotta at home too, must make these! I'll be making these- how simple. The frosting looks great! Just printed out the recipe ~ gonna give it a try. Thanks for sharing! OK!! Those cookies look fresh and incredible. Was your husband a hit at work with those cookies?? Like I said, I am sending all my food your way so you can take the photos. OK? THANKS!! wow che belli!! chissà che buoni!! mmm.. Thanks for the comments ladies! Jesse said they really enjoyed them. I hope they did anyway. Those are just darling! I love the dollop of lemon frosting. Heaven! Very creative. Sounds like you just whipped these up with no effort...love it. I'm with ya, I'd prefer a new baking project over an old one any day. Well, I think you are brave, though there is a fine line between brave and reckless as my husband would say under similar circumstances! But the cookies came out perfect and they look so lemony luscious and moist and delicious! Good for you! ps - Thanks for keeping in touch - you know why I've been away and am now trying to get back to "normal". Don't forget me my sister! So sorry I haven't visited as much. I have to force myself to blog at all lately. I just want to go outside and play like a 5-year-old lately. I'm rebelling against the next Idaho winter I think. It will get better when I accept it's going to be horribly cold soon. I think you're the most creative blogger with regards to cake mixes. Love the way you dolled this up. This has been added to my to do list. These cookies look great. I love lemon ricotta cookies and lemon cake mix cookies, so this recipe is a match made in heaven for me! Your site is such a source of inspiration! I made these tonight and they are great! I didn't put icing on them yet. Can't decide if they need it or not. I'll probably do half and half. Steph thank-you for making these! I often feel these old posts get lost. I am so happy to hear you like them too!